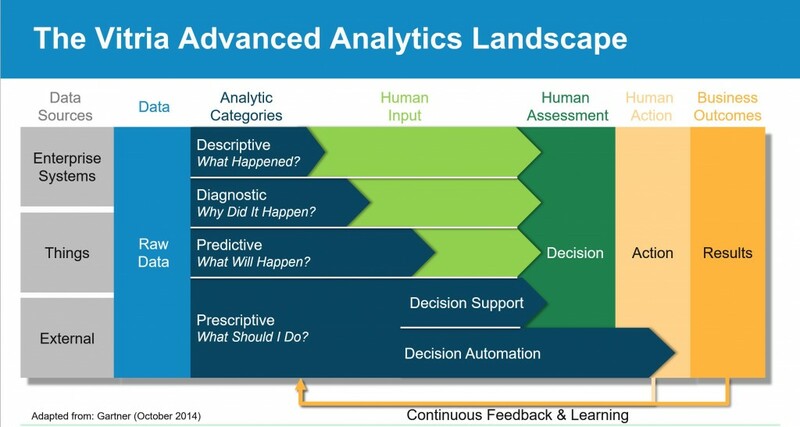 Let’s talk about Business Applications for Analytics and the Advanced Analytics Landscape. 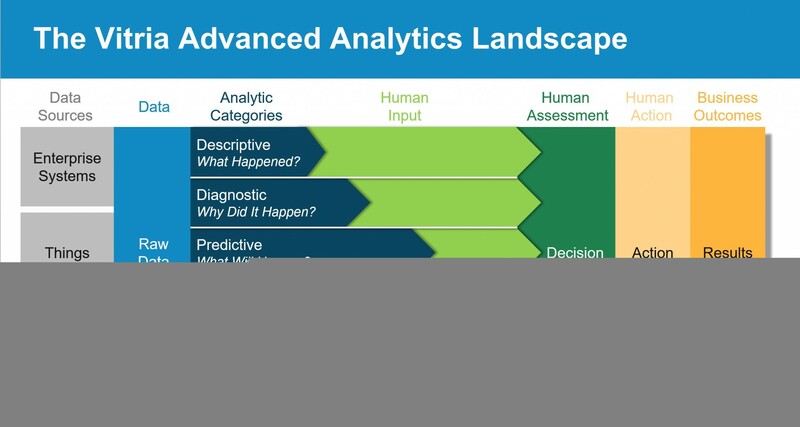 To get started, let consider the Advanced Analytics Landscape Gartner created in 2014. It provides a nice framework in which to think about IoT analytics as well as the opportunities it provides to drive new revenue and reduce expenses. Prescriptive Analytics – What should I do? One of the most obvious business applications for analytics is Historical Analytics. Historical analytics is a combination of descriptive analytics (what has happened) and diagnostic analytics (why something happened). Currently most business analysts focus on historical data – including big data – and use reporting tools to explore the data and prepare presentations that are given to various teams and decision makers. The output is used for executive decision makers to take some sort of action. Often this is action is taken in some business process for business systems unrelated to the analytics alone. More mature businesses use the historical information to start trying to predict what will happen in the future. This is known as prescriptive analytics. It is used by business decision makers to react more quickly and avoid repeating similar problems. To help drive more effective human assessment and decision-making by recommending data-driven actions that can be assessed easily and socialized within organizations. To automatically prescribe a course of action to take place and alert decision makers that an action is needed. In the latter case, the actions can be either automatic or triggered by a decision maker depending on certain criteria and urgency. Most companies today are still operating at the descriptive and diagnostic analytics level. Some are leveraging predictive analytics using traditional BI and reporting tools to perform their work. When it comes to the business applications for analytics, we feel that Gartner’s Advanced Analytics Landscape can be extended in a couple of critical areas. First, there are new types of data sources to consider and the impact they have on the landscape. For example, the data sources in the model are primarily data from enterprise systems. Although this includes big data, it does not include real-time data that is now available from an increasing number of sources. This real-time data flows in on an ongoing basis from “things” both internal and external to the company. For example, temperature data and usage data from equipment from internal sources. Weather or climate temperature data is publicly available from external sources. Performing analytics using these external and real time data sources coming from all of the sensors in the environment is called IoT Analytics. The Internet of Things will have a dramatic impact on the business applications for analytics. Companies that do not embrace the new model will quickly lag behind their competition. To learn more about exactly how this works and the tremendous impact that IoT analytics can have on the Advanced Analytics Landscape, watch the video.